How drought may change in the future are of great concern as global warming continues. In Part I of this study, we examine the uncertainties in estimating recent drought changes. Substantial uncertainties arise in the calculated Palmer Drought Severity Index (PDSI) with Penman-Monteith potential evapotranspiraiton (PDSI_pm) due to different choices of forcing data (especially for precipitation, solar radiation and wind speed) and the calibration period. After detailed analyses, we recommend using the Global Precipitation Climatology Centre (GPCC) or the Global Precipitation Climatology (GPCP) datasets over other existing land precipitation products due to poor data coverage in the other datasets since the 1990s. We also recommend not to include the years after 1980 in the PDSI calibration period to avoid including the anthropogenic climate change as part of the natural variability used for calibration. Consistent with reported declines in pan evaporation, our calculated potential evapotranspiration (PET) shows negative or small trends since 1950 over the United States, China, and other regions, and no global PET trends from 1950 to 1990. Updated precipitation and streamflow data and the self-calibrated PDSI_pm all show consistent drying during 1950–2012 over most Africa, East and South Asia, southern Europe, eastern Australia, and many parts of the Americas. While these regional drying trends resulted primarily from precipitation changes related to multi-decadal oscillations in Pacific sea surface temperatures, rapid surface warming and associated increases in surface vapor pressure deficit since the 1980s have become an increasingly important cause of widespread drying over land. 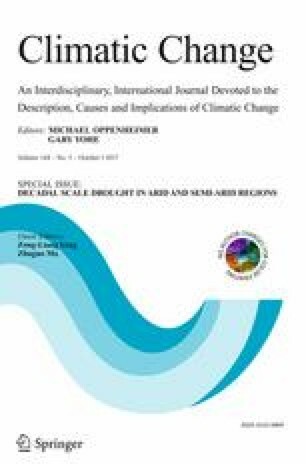 This article is part of a Special Issue on “Decadal Scale Drought in Arid Regions” edited by Zong-Liang Yang and Zhuguo Ma. The online version of this article (doi: 10.1007/s10584-016-1705-2) contains supplementary material, which is available to authorized users. We thank J. Scheff, G. van der Schrier and another anonymous reviewer for constructive review comments. This study was supported by the National Key Basic Research Program of China (Grant No.2012CB956203), the U.S. National Science Foundation (Grant #AGS-1353740), U.S. Department of Energy’s Office of Science (Award #DE-SC0012602), and the U.S. National Oceanic and Atmospheric Administration (Award #NA15OAR4310086). Myhre, G., et al, 2013: Anthropogenic and natural radiative forcing. Climate Change 2013: The Physical Science Basis, T. F. Stocker et al., Eds., Cambridge University Press, 659–740, doi: 10.1017/CBO9781107415324.018. Swenson, SC (2012) GRACE monthly land water mass grids NETCDF RELEASE 5.0. Ver. 5.0. PO.DAAC, CA, USA. Dataset accessed on 2016–02-24 at doi: 10.5067/TELND-NC005.